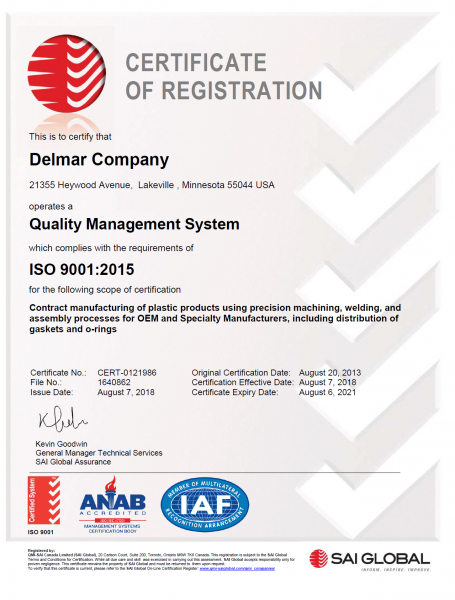 On August 20, 2013, Delmar Company received ISO 9001:2008 certification through SAI Global, an independent standards certification company. On August 7, 2018, we recertified under the new ISO 9001:2015 standards. Our ISO certification is in service of our Company Mission to provide high quality products and service to our customers through continuous improvement. Our Company Scope encompasses the contract manufacturing of plastic products and fluid sealing products for OEMs and specialty manufacturers, using precision machining, welding, and assembly processes. For more information regarding our ISO 9001:2015 certification and our ongoing commitment to process improvement, feel free to contact us.